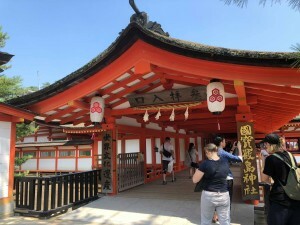 Itsukushima Shrine is the “Ichi-no-miya(一ノ宮)” Shrine in Aki(安芸) country ( an old name for Hiroshima and its surrounding areas ). “Ichi-no-miya” means the top shrine in a certain area. Each shrine has its own gods and goddesses.The shrines are ranked according to the level of power their gods or goddesses hold. 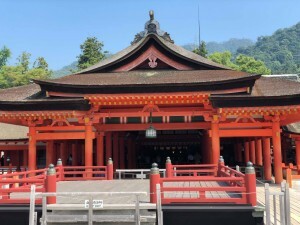 The top ranked shrine with the most powerful god is called an “Ichi-no-miya”.Itsukushima Shrine is the “Ichi-no-miya” Shrine for the goddesses of marriage and matchmaking. Itsukushima Shrine was originally built during the Heian period ( 794-1185 ) for the safe sailing in the Setonai-kai sea(瀬戸内海) which is located between the Japanese main islands of Honshu and Shikoku island.Over time Itsukushima Shrine became the shrine for marriage and matchmaking. 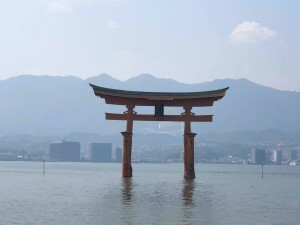 There are about 500 Itsukushima Shrines in Japan.Itsukushima Shrine in Hiroshima is the principle shrine. 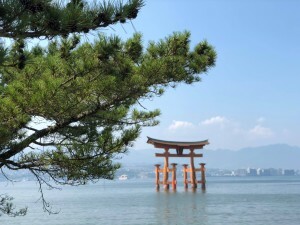 Itsukushima Shrine is located on a small island in Hiroshima Bay called Miya-jima(宮島). 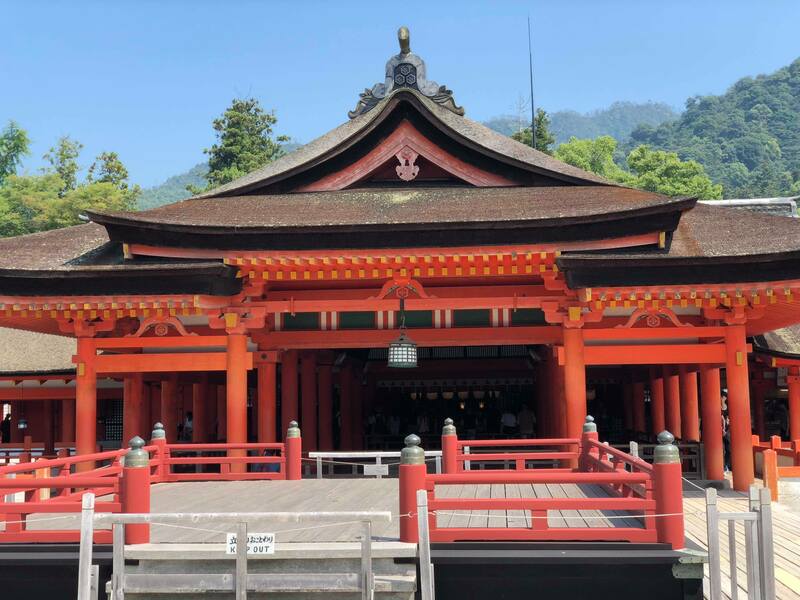 The island is known for its outstanding beauty and Shinto Shrines dating back to 12th century.Itsukushima Shrine and Miya-jima island are both a UNESCO World Heritage Site. The foundations of the shrine are built over the sea. It appears to be floating.So, during daily high and low tides, you can enjoy various scenery changes.Miya-jima island has been a holy place of Shintoism since the earliest times.The island itself is “Go-shin-tai(御神体)”. Holy objects like a boulder, a tree and so on can be “Go-shin-tai”.People connect with gods through “Go-shin-tai”. In older times, there were stringent rules to visit “Go-shin-tai” island. For example, the burial of dead bodies was prohibited and women could not visit the island 100 days after child birth. 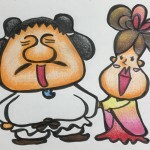 In ancient Japan, women were considered dirty, so females were usually prohibited to enter holy sites. You can still see evidence of this in Japanese modern culture. Kabuki acting and Sumo wrestling are still performed by only men. 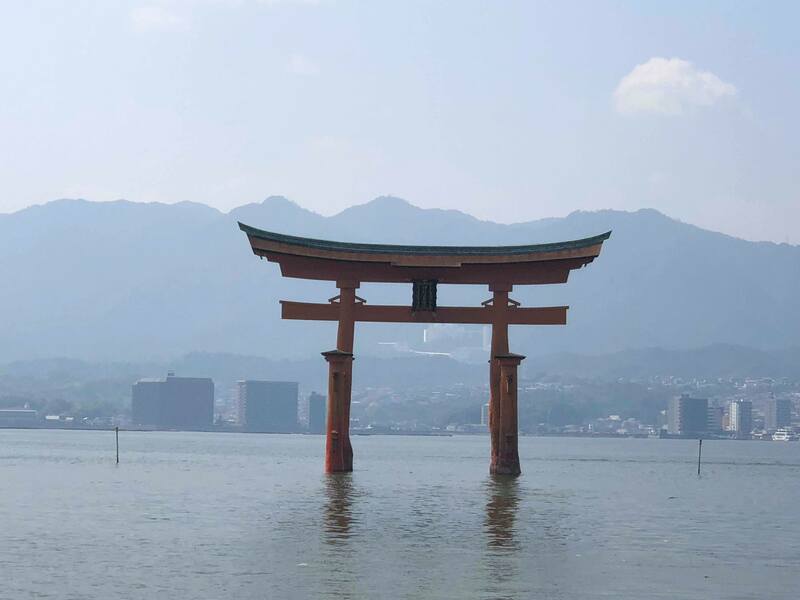 Itsukushima Shrine and island are now a major tourist attraction and considered a National Treasure in Japan. Please enjoy the peace, beauty and tranquility of the island. Itsukushima Shrine is dedicated to the three beautiful sisters. Each god or goddess has their own slave animals.The three goddess sisters have crows. Crows are still believed to be divine creatures by some in Japan.1,400 year old shrine, three beautiful goddess sisters and the sacred crow are connected. Isn’t that cool, don’t you think? Before you explore and enjoy the beauty of Itsukushima Shrine, you must cleanse your body and soul. Behave calmly and respectfully, clear your mind of stress and calm yourself. Every Shrine has a purification fountain near the entrance.Take one of the wooden dippers provided with your hand and rinse your left hand.Then rinse your right hand with left.Then pour a little water into your left cupped palm and rinse your mouth.Spit the water into the ditch surrounding the fountain.Do not drink from the dipper and do not swallow the water.Lastly, fill the dipper again, hold it vertically so the water runs down the handle.Then place it back to the original position.You are now purified and ready to enter the shrine. BUT! 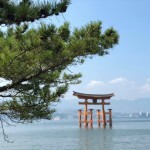 Itsukushima Shrine has a second step for purification. After you enter through big red shrine gate called the “Torii”, head for “Maroudo-Shrine(客神社).” Maroudo-Shrine?But I’m visiting Itsukushima Shrine! Even for me, a native 36 year old Japanese, it’s complicating to explain a shrine has a shrine. Maroudo-Shrine is a Shisha. Shisha is a second in rank to the main shrine. Sometimes called an auxiliary shrine. It’s dedicated to a god or goddess which has very high holy and spiritual level in the main shrine. 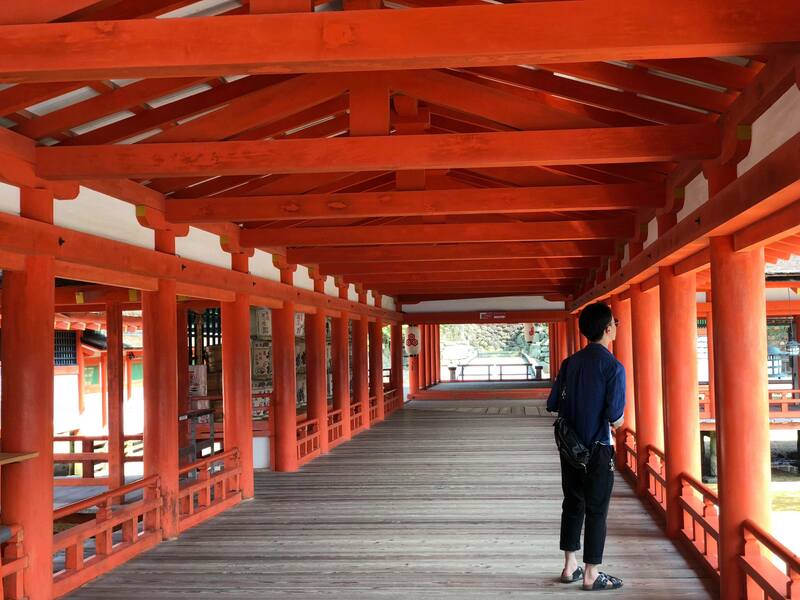 It’s here that you will purify yourself again before entering Itsukushima Shrine. 1. Hold a skewer at your chest hight. 2. Brush your shoulders with it, left, right and left shoulder again. 4. Put the skewer on the original position. If you look back there, you can see the five-story pagoda. Itsukushima Shrine has a round corridor. And it’s foundations are built over the sea. By walking in the corridor, you can purify yourself. 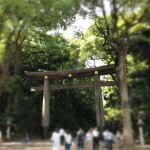 You can see the beautiful “Torii”, shrine gate. The basement of the gate is over the sea. So when it is high tide, the gate seems to be floating on the sea. That is very unique to Itsukushima Shrine. You should see the scenery live. When it’s low tide, you can see three ponds of mirrors. They contain fresh spring water. Moon light can be reflected on the ponds. It’s really romantic and beautiful. There is a very arched bridge in Itsukushima Shrine. 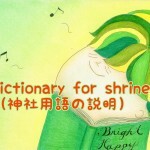 There are many arched bridges in Japan and the bridge in the shrine is the oldest. Nobody is permitted to go across the bridge, but it’s worth seeing. After enjoying Itsukushima Shrine, please eat “Momiji-manju.” It is one of specialties in Hiroshima. It is a small steamed bun in the shape of maple leaves. And it contains sweet bean paste called “anko.” You will be given great energy of Itsukushima Shrine by eating it. Ladies will be given the power to enhance your enchantment. Men will be given the power to find your soul mate.